← (#228) Motivation: What Gets You Going—and Keeps You Going? (#229) Where Can You Declutter Your Life? Where have you allowed clutter to invade your life? 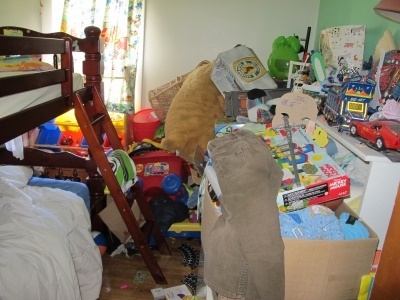 When you hear the word clutter, what pops into your mind? A desk with piles upon piles of paper? Your kid’s bedroom? Your bedroom? The kitchen sink? The backseat of your car? The garage? Your sock drawer? The bottom of your closet? Clutter can cost us in time lost looking for something, money spent (for items we thought we had lost), money lost (because of wasted productivity) and stress endured dealing with the overwhelming mess that feels like a hurricane about to slam ashore. And it can interfere with our true priorities as it distracts us from the important things in our lives. What else clutters your life? Is all this stuff making me happy? How do I know? What are my core values? Does the clutter add to or detract from these values? One of the most poignant gut-check questions I read recently was in a post about balanced life: “Why did we have kids if you’re too busy to see them?” Ouch! Are you holding on to stuff because you “might” use it in the future? Really? When was the last time you used that set of dishes or golf clubs? Look at the list above (and anything else you added to it). What small clutter item can you start on today? Then, where can you move to tomorrow? Think large and long-term. Act small and short-term. If you can’t get a handle on your clutter, find a coach, mentor or expert who can. A friend (and former student) of mine has created such a business where they act as “personal trainers for your stuff.” Find a trainer for your situation. Whatever it takes, wrestle control of your life back to where it belongs—with you. Delbert McClinton sings to us about the challenges of too much stuff! This entry was posted in Goals, Motivation, organization, priorities and tagged clutter, goals, motivation, organization, priorities. Bookmark the permalink. 4 Responses to (#229) Where Can You Declutter Your Life? Simplify your life. Reduce technology and information overload. At first I picked this post, because it was the first one out of almost 300. In all honesty I really needed to read this. I am a pack rat, I keep everything. This of course is horrible, although I am fairly organized. I find that it is becoming difficult to remain organized. I also over schedule my days trying to remain productive. This is a hindrance. This post has helped me realize clutter mentally,physically or even emotionally is not healthy. I am now looking forward to making changes in my life for the better. Than you I really needed to read this, and once I declutter I know it will be like a breath of fresh air. Thank you! Glad you found the post of help. Remember, you can start small and work toward the larger goal of decluttering!